Gemini Jr. - Standard model includes: UA nose, 5" x 1-1/4" gray polyurethane flat tread casters, and double grip handle. Gemini Sr. - Standard model includes: UA nose, 5" x 1-1/4" gray polyurethane flat tread casters, and U (#11) handle. 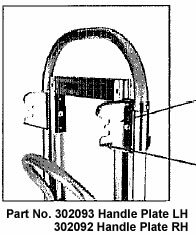 NOTE: Gemini hand trucks are shipped KD in a box unless otherwise specified. suited for moderate to mild climates. ease of use and maximum strength to weight ratio. Nose AA die cast aluminum - 14" x 7-1/2"
Nose AM die cast magnesium - 14" x 7-1/2"
Nose UM die cast magnesium - 18" x 7-1/2"
Nose HM die cast magnesium - 14" x 12"
The new one-piece design of the lock shaft better withstands impact and maintains shape. 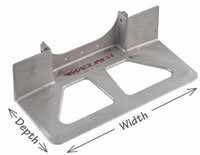 New handle plates are designed to prevent flaring out over time, improving durability. tab combination and prevents part breakage. 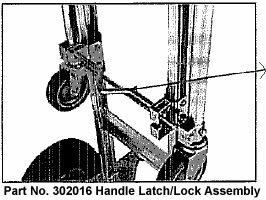 lock assembly for easy field retrofit. user comfort when converting to 2-wheel mode. to prevent part flare and improve durability. from resting on forearm when used in 2-wheel mode.  Single piece design has no rivets to loosen or break.  Additional formed features to improve rigidity. Description: Newly engineered lock shaft and handle plates. 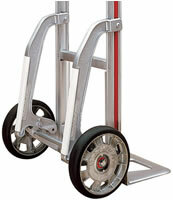 Luggage Trucks, Magliner, and Stair Climbing Hand Trucks from your source for material handling equipment.